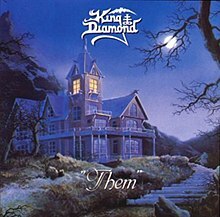 "Them" is the third studio album by King Diamond released in 1988 on Roadrunner Records. Them is the first album to feature guitarist Pete Blakk and bassist Hal Patino. As the album opens, a young King and his mother and sister are welcoming King's grandmother home from a mental asylum. That night, King investigates strange voices and discovers his grandmother having a tea party seemingly alone, though with the teacups and kettles floating in the air. King is invited into the room, to sit in his grandmother's chair. King is sent back to bed, but only after staring into his grandmother's eyes, whereupon she instructed him to forget what he saw. After fainting and regaining consciousness, he decides to attack his grandmother. He notices that "their" power is weakened outside the house, so he lures his grandmother outside and kills her. The voices of Amon continue to haunt the boy as he is questioned by police and incarcerated in an asylum. Years later, he is released and returns home to find his grandmother and the voices of Amon are still very much alive. Rehearsal versions of The Invisible Guests and Bye, Bye Missy featured King and Andy on guitars, Mikkey on drums and Timi Hansen on bass. The song "Welcome Home" and lyrics from the song "Invisible Guests" were featured in the movie Clerks II. "Welcome Home" was also featured in the 2009 video game Brütal Legend. This page was last edited on 30 October 2018, at 00:19 (UTC).